She is Canadian, studied dance, and now lives in Brooklyn. Her two novels to date have been published by an admirable house, Unbridled Books, a small independent outfit with both great taste and exquisite production values, and the reviews she has collected so far have been chock-full of praise. So why isn’t she better known? One reason is that her books are possibly too good and unconventional for the crime and mystery field, and have not been marketed as such. They are layered and enigmatic; they sometimes make the lazy reader work more than is common; they are full of characters who are not necessarily likeable (although they all ring so true to life); they are delicate, allusive, and heartbreaking; and, oh, they often have very few crimes. No bodies in the garden, no forensics or investigations to speak of, no heroes, in fact. And I love them for daring to be different and resolutely unfashionable, but true to themselves. I’m no longer sure where I first read about her (possibly on Sarah Weinman’s blog? ), but what I did come across sounded up my street so I ordered her two books. 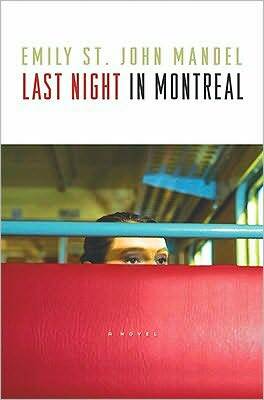 Her first novel, Last Night in Montreal (2009), connected with me from the outset and enchanted me, insofar as a book full of bleakness can, and immediately reminded me of the first time I opened the pages of Marc Behm’s The Eye of the Beholder, which I’d bought blind in a charity shop on London’s Finchley Road because the blurb intrigued me. I later became Behm’s British publisher as a result. Both books are about lives that never connect, about prosaic detectives in search of lost young girls, about the way fate orchestrates our despair, about quests that can never be won, about life. I could not make Mandel more of a compliment than to evoke Behm’s twice-inaccurately-filmed masterpiece and one of my favorite crime books of all time. Ironically, it is a novel she is totally unaware of! Last Night in Montreal is a road book of sorts, the setting moving from Brooklyn to Montreal, via New Mexico, Arizona, and Rome. Lilia, a woman running from her past, leaves Eli with no word of explanation, stepping out of their apartment for coffee and never returning, shattering his life in the process. In parallel, Michaela, a stripper in Montreal, is also at odds with the world, her childhood marked by an absent father, a private investigator who became obsessed by the case of a missing young girl (who happens to be Lilia). The three characters’ lives intertwine and finally intersect in Montreal after a sad journey through the wastelands of their respective pasts, a journey punctuated by desolate motel rooms and Gideon Bibles abandoned in dusty drawers with arcane messages to the future written in them. The trio’s final encounter is tragic and leaves two of the protagonists as confused and melancholy as before, but the novel’s overall atmosphere grips you by the guts and heart and resonates for ages afterward inside. Such small crimes are lives wasted on the altar of dreams. Mandel’s new novel, The Singer’s Gun (2010), is as ambiguous in its dreamy representation of the world, although there is, as the title attests, a gun at the crux of the plot, and a murder—but those elements of mystery are nowhere as important as the sad tango of relationships that lie at the book’s heart. Anton Waker comes from a family of small-time crooks and forgers, which he wants out of but is seduced by his cousin Aria into doing a final job following his marriage to Sophie. He is to take a package to the island of Ischia in Italy, where he is honeymooning, and wait for it to be picked up by an unknown person. An agent working for the State Department and investigating the Wakers monitors him from afar, and we watch the story unfold. As the awkward honeymoon comes to an end, Anton remains on his own on the island and succumbs to the ghosts of the past as his life unravels. Again, a book about people waiting for the impossible, with whom it is so easy to identify: such is the poignancy of their inability to rise above the problems that everyday life confronts them with. Mandel displays a voice like no other. She is subtle, quiet, but devastating in her unerring talent to disturb the reader through the conservative use of crime tropes and damaged characters, whether they be a Montreal dancer pining for the love of her father or an abandoned wife unable to see through her husband’s despair, and in her impressionistic way of unfurling the delicately engineered plots, revealing layers and layers of gentle betrayals and feelings. There is maybe something determinedly European about the existential angst that pervades her pages, but when allied with the criminal elements she employs to illuminate her tales in the manner of, say, Patricia Highsmith, it only proves her to be a writer of rare compassion and compelling characters. I urge you to discover her. As someone who reads so much crime and mystery and has, at times, grown tired of the many clichés of our genre, I find her refreshingly different, and I, for one, am intrigued to see what she will come up with next (and whether it will again linger like a cloud on the frontiers of our genre). I have been encouraged to commission a new short story from her for my forthcoming Venice Noir anthology for Akashic Books and am eager to be shocked and surprised. And if any of you have not read Marc Behm, please do so. Beyond The Eye of the Beholder, there are a handful of other quirky novels, such as Afraid to Death, that will dazzle and haunt you (and are nowhere near what you’d expect from the screenwriter of Charade and the Beatles’ A Hard Day’s Night! ).